Let me tell you something. The best part of a gathering isn’t the decorations. It isn’t the food even. It is the community of people that come together to create something and then enjoying the fruits of their labor. A great gathering doesn’t happen of the hands of just one. It takes a village and it was intended to. Great gatherings aren’t created with magic wands. 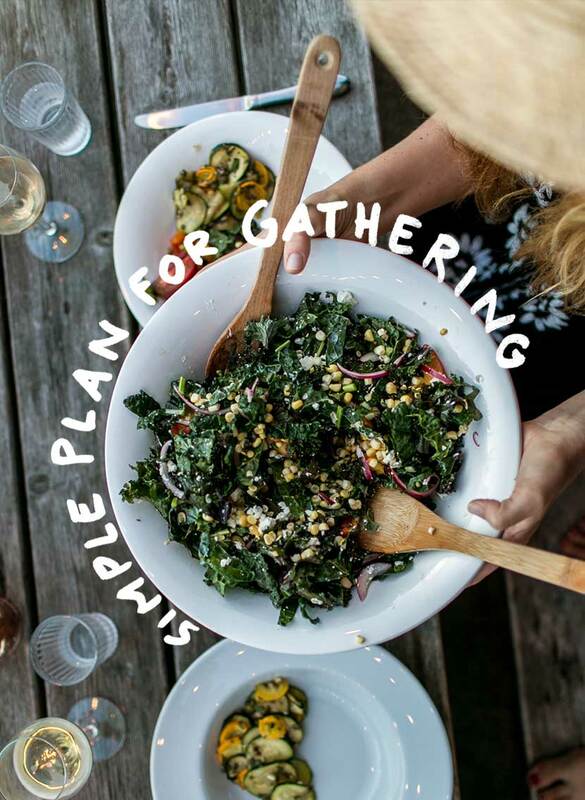 Even the most intricate gatherings on Pinterest weren’t hosted or created by just one person. It took many hands to make everything to fall into place. When I look at images of gatherings I have had in the past (you can see all of them here), I see stories. What I see is the story of how we couldn’t find a table but a friend had some wood and cinder blocks so we made a table. I see stories of guitars showing up late in the evening without plans. I see a friend who wanted to try his hand at paella over an open flame. I see running with tarps to cover a table before the rain came unexpectedly. I see a friend filling water glasses for everyone. I see a friend bringing bread from his bakery. Though these gatherings show up here on Fresh Exchange, they aren’t just done solely by me. No gathering is. 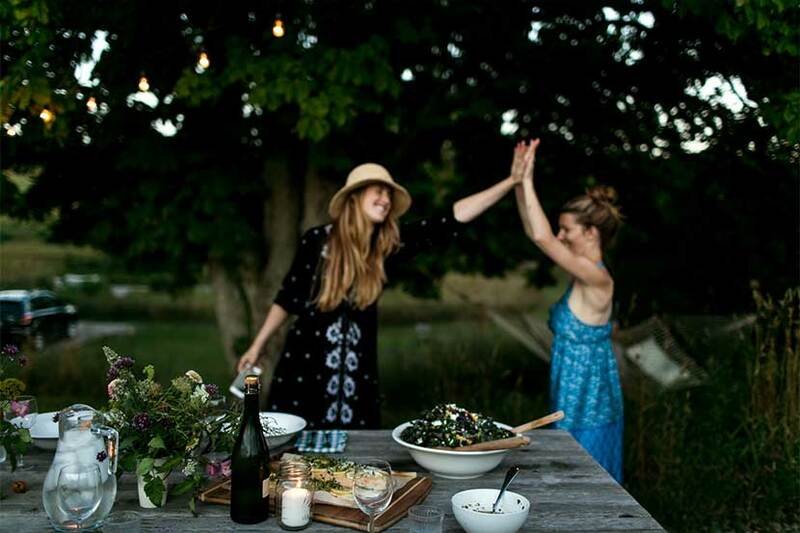 Gatherings are intended to bring together everyone in various ways. First and foremost keep your guest list doable. I ALWAYS suggest keeping your numbers between 6-10 people. This means you should have enough silverware, dishware, and drinkware to accommodate everyone. Plus most everyone has a table or space that accommodate that many people whether inside or outside. You know your guest list so now it is a matter of getting on everyone’s calendar, right? I suggest choosing a month, creating a group text chain, and then throwing out some dates. See when everyone is available and make it happen. Before you plan anything else nail down the date. Once everyone has agreed on a date, now pick somewhere to have the dinner. 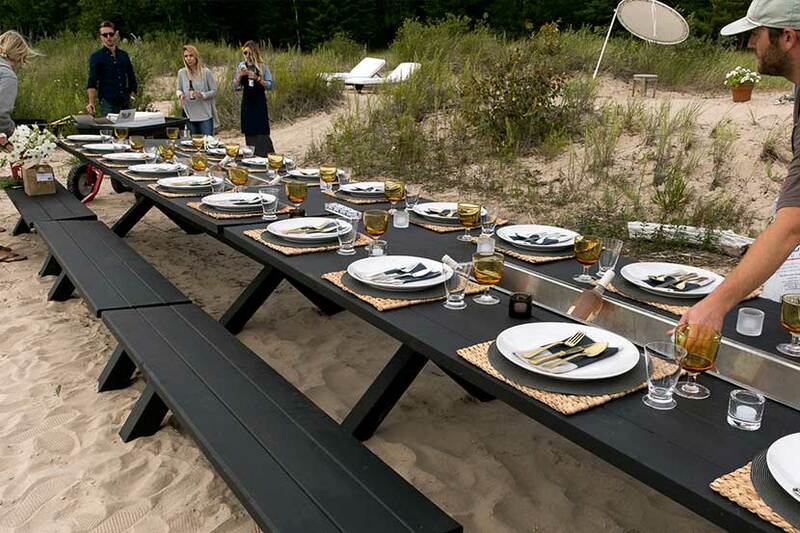 If the weather will still be good, see if someone has a backyard or place where you can host the dinner outside. If that is the case, remember to have a back up whether someone else’s home or even in a barn or extra space that is covered. Make sure whatever space you choose can accommodate the people coming and the host is okay with cooks in their kitchen. This sounds silly to make a big deal out of, but for real it is where the dinner will be had. Think outside the box though. 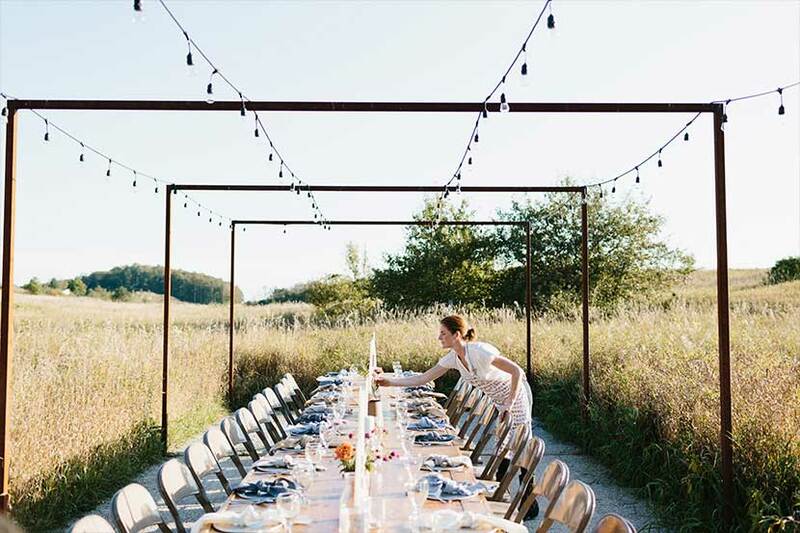 Don’t just think you need some special farmhouse table or rustic seating arrangement. If you are doing it indoors at someone’s home who already has a table, just make sure they have room to accommodate guests and enough chairs. I also always keep a chair or two on hand in case a friend brings an unexpected guest. The more the merrier right? Have someone or two people bring the decor for the table. 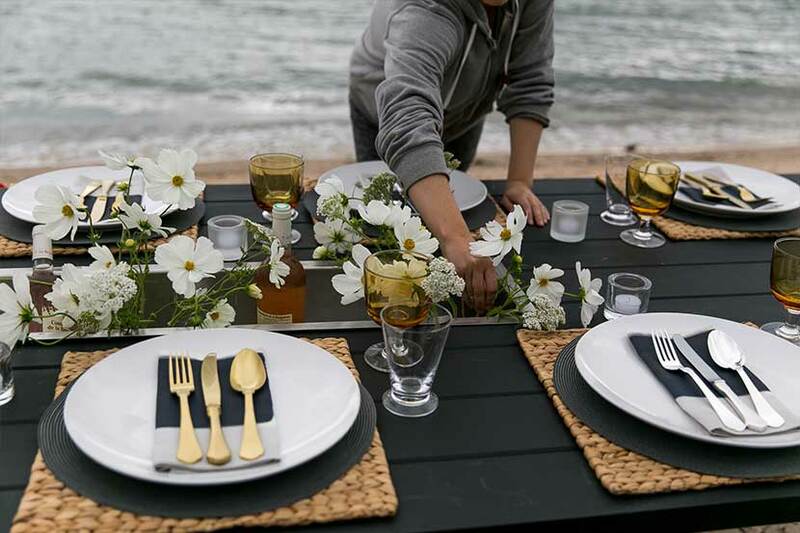 This doesn’t have to be much more than white plates, napkins, florals, and some candles. Your host may have some things on hand. 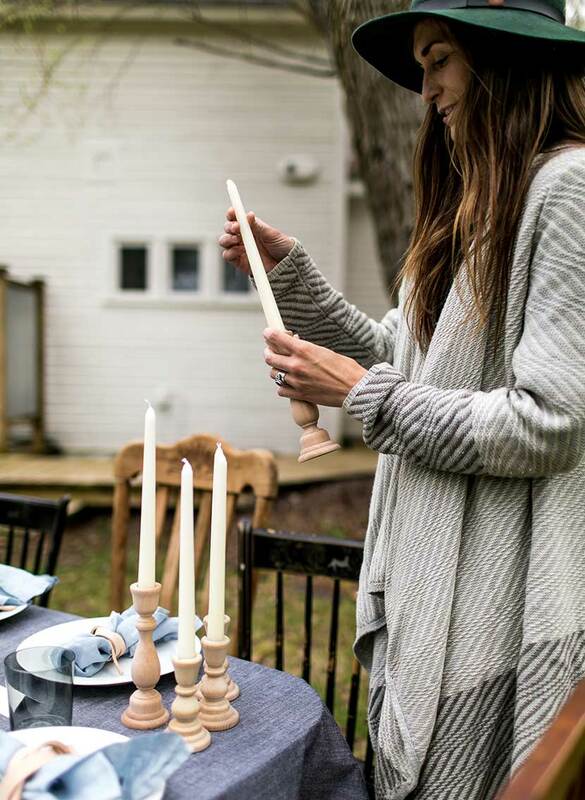 The key though, stick to a simple palette of neutrals (no matter the season). White dishes do wonders. 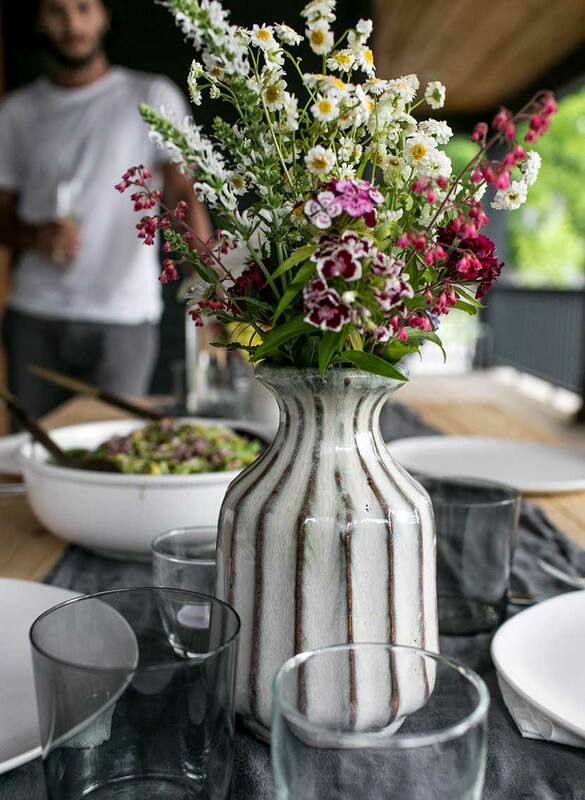 To feel more seasonal, gathering centerpieces from the market or from the outdoors. It may be fallen leaves or pine branches or even dried herbs. All of it will help bring the season to the table. I like to give everyone a chance to make or bring something. 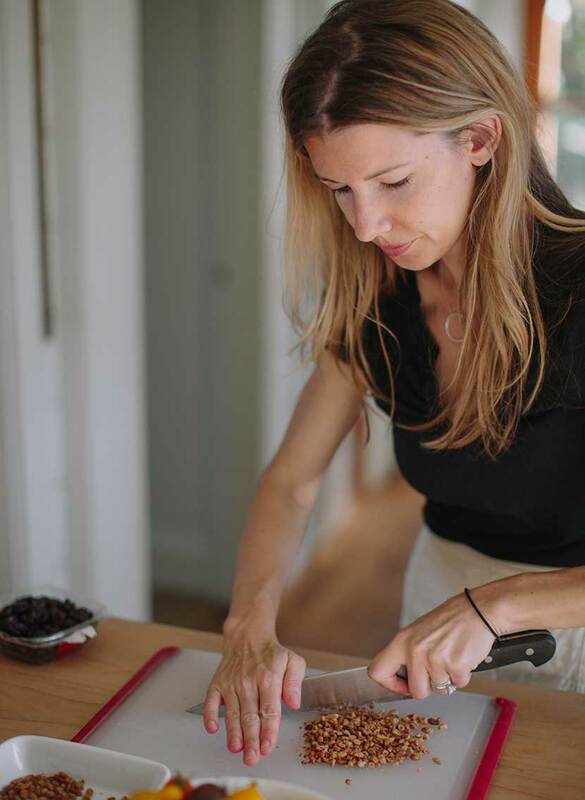 You can get serious and choose something out of a cookbook in each category (great for cookbook clubs if you start one) or just ask everyone to bring their favorite seasonal dish but give each person a category (salad, dessert, main, etc). This is the best way to get the food taken care of. If no one wants to cook, ask to split the cost of a catered meal. That can be fun as well. Also, don’t forget the appetizers and dessert. Make sure it is covered as well so guests have plenty to eat and don’t drink on an empty stomach. Personally, we do BYOD (Bring Your Own Drinks) for our gatherings. Everyone likes different things so it is fun to just let people bring what they want to drink for the evening. Don’t mess with fancy cocktails unless someone volunteers to do so. Whether it is a Bose speaker or a friend wants to play some music. No matter what make sure someone can bring the tunes to the party. Many hands make for light work. Make sure you get the help of everyone to do dishes and clean up so the host doesn’t wake up the next morning with a mess in front of them. The thing that will easily make a gathering not happen again for someone is if the mess is still there in the morning. Help out no matter the # of glasses of wine. The day of, I suggest arriving before dinner if you are helping with the setup. Begin prepping the table and setting if there is anything to do. Maybe you need to set some string lights or pick up some candles. Run the errands and be prepared. If not just make sure that your part in the gathering is ready for that evening. You heard me. The details are not what make the evening. The company that created the gathering is what matters. No matter what your gathering ends up being it should bring you joy not because it looks Instagram ready, but because it has the ones you love the most around you and you are sharing an evening all together. So tell me, what gatherings are planning these next few months. What questions do you have?! Can I help you tackle anything!? I cannot wait to hear about your own #ASimpleEvening these next few months of fall.